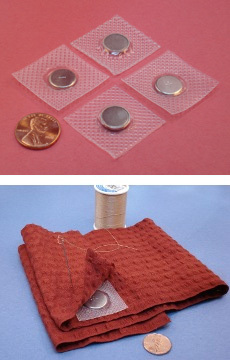 These great Sewing Magnets are designed especially for sewing into fabrics. Great for purses, clasps, and many other magnetic attachments for clothing and other textiles. These magnets also work great as magnetic clasps in binders, folders and other printed materials. Sewing magnets are sold in matched pairs. An order quantity of 1 gets you two magnets. For items that are frequently washed, we recommend the plastic cover included on this magnet, which helps protect it from moisture. For items that are infrequently washed, our SW-S is the same magnet without the plastic cover. Machine wash cold, dry on low heat. Choose your size based on the thickness of all material layers between the magnets in your application. A pull force between 1 and 3 pounds is a good target, though the desired strength does depend on the application. This magnet is great for a total material thickness of 0.01" to 1/16". The table below shows the expected strength when used with a variety of materials. The Pull Force assumes the magnets are separated by two layers of the fabric.